If you're looking for a great (and cheap!) hotel in Guadalajara, CheapTickets is the best place to find them. We offer deals on the best 307 hotels throughout Guadalajara. No matter what you're looking for, we have options for you. Grab great rates on the 176 affordable 3-star hotels that are easy on the wallet without sacrificing comfort. Looking for more luxury? Try one of the 24, 4-star hotel accommodations in Guadalajara. No matter your budget needs, we've pulled out all the stops to make sure you have plenty of vacation options. Maybe you prefer to search for your hotel deals based on what each hotel offers? For example, let's say you just want to find a hotel or resort that has a pool to cool off in after a long day exploring Guadalajara. Scroll down to choose from the 84 hotels in Guadalajara that has a pool for guests. Or search for deals on Guadalajara hotels offering free wifi or breakfast, non-smoking rooms, and more! CheapTickets is here to be your personal travel agent for your next trip to Guadalajara. Get booking today! What hotels in Guadalajara offer free wifi access? Hotel Morales Historical & Colonial Downtown Core, a 3.50 star hotel in Guadalajara that offers free wifi access for guests and has rooms starting as low as $65.00 per night. 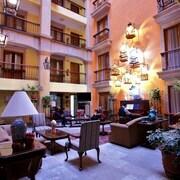 Hotel Galeria Casa Tlaquepaque, a 3.50 star hotel in Guadalajara that offers free wifi access for guests. Hotel Portonovo Plaza Centro, a 3.50 star hotel in Guadalajara that offers free wifi access for guests and has rooms starting as low as $30.00 per night. NH Collection Guadalajara Providencia, a 4.50 star hotel in Guadalajara that offers free wifi access for guests. Are there deals on Guadalajara hotels offering free breakfast? Yes! The only thing better than finding a great deal on a cheap hotel in Guadalajara is finding one that offers free breakfast. Grab some eggs, a waffle, or some healthy oatmeal before a day full of exploring Guadalajara and all that it has to offer. Below are just some of the many hotels that offer free breakfast in Guadalajara. One Guadalajara Centro HistÃ³rico is a 3.00 star rated hotel property in Guadalajara that offers free breakfast. Hotel De Mendoza is a 3.00 star rated hotel property in Guadalajara that offers free breakfast. La MansiÃ³n del Sol is a 3.50 star rated hotel property in Guadalajara that offers free breakfast. La MansiÃ³n del Sol room rates start as low as $55.00 per night. Hotel Victoria Ejecutivo is a 3.50 star rated hotel property in Guadalajara that offers free breakfast. 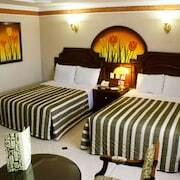 Hotel Victoria Ejecutivo room rates start as low as $73.00 per night. What about deals on pet-friendly hotels in Guadalajara? Guadalajara is a great place to get outside and explore with your pets in tow so don't leave your furry friends behind. Below you'll find great deals on hotels in Guadalajara that allow pets. Don't forget to bring plenty of treats! El Tapatio Hotel And Resort is a popular, pet-friendly, 3.50 star hotel in Guadalajara. 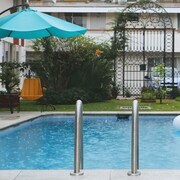 Hotel Demetria is a popular, pet-friendly, 4.50 star hotel in Guadalajara. 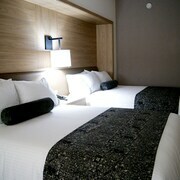 Room rates start as low as $108.00 per night. Aloft Guadalajara is a popular, pet-friendly, 3.50 star hotel in Guadalajara. 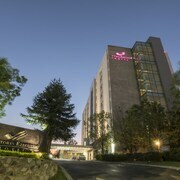 The Westin Guadalajara is a popular, pet-friendly, 4.50 star hotel in Guadalajara. Any good rates on Guadalajara hotels with restaurants? Absolutely. Don't want to deal with planning our all your meals on your trip to Guadalajara? We don't blame you. Keep the hangry away by staying in one of the 132 hotels that have restaurants. With a room at one of these spots, all it takes to get a good meal is hopping in the elevator. Check out some of the most popular hotels in Guadalajara that have restaurants below. 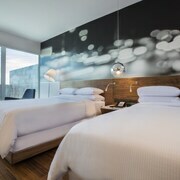 Book Hotel Fenix Hotel Fenix is a 3.00 star hotel and has one or more restaurant options. Book Wyndham Garden Guadalajara Acueducto Wyndham Garden Guadalajara Acueducto is a 3.50 star hotel and has one or more restaurant options. Book Hotel Casino Plaza Hotel Casino Plaza is a 3.50 star hotel and has one or more restaurant options. Book Hotel Portobelo Hotel Portobelo is a 3.00 star hotel and has one or more restaurant options. What are the cheapest hotels in Guadalajara with pools? What's better after a long day exploring Guadalajara then a relaxing dip in a pool? Finding the Guadalajara hotel you need for a bargain! Cool off and unwind at one of our 84 Guadalajara hotels with a pool. Browse some of the top deals on these hotels and resorts with pools in Guadalajara below, but be warned: You may not want to check out! Hotel Danza del Sol has a pool and a 3.00 star rating. 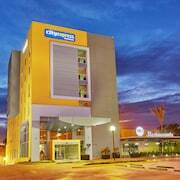 Hampton Inn by Hilton Guadalajara-Aeropuerto has a pool and a 2.50 star rating. Ramada Encore Guadalajara has a pool and a 3.50 star rating. With room rates starting at just $80.00 per night. Hotel Estancia has a pool and a 3.50 star rating. What hotels in Guadalajara offer parking for guests? Once you've made your way to Guadalajara, the last thing you want to deal with is finding parking close to your hotel. Avoid the hassle of parking around the block and carrying your luggage all the way to the lobby by booking one of our hotels with parking. Check out deals on some of the 165 hotels in Guadalajara that offer parking for guests. Hotel Portobelo This hotel has a 3.00-star rating. Hotel Estancia This hotel has a 3.50-star rating. Ramada Encore Guadalajara offers parking for guests and has room rates as low as $80.00 per night. This hotel has a 3.50-star rating. Holiday Inn Express Guadalajara Aeropuerto This hotel has a 3.00-star rating. Do Guadalajara hotels offer 24-hour concierge services? When you're on vacation, things don't always go according to plan. Travel with peace of mind when you book one of our 63 hotels in Guadalajara with 24-hour concierge service. That way you know help is always phone call or elevator ride away. Try NH Collection Guadalajara Centro HistÃ³rico. It's a 4.50 star rated hotel in Guadalajara that offers concierge services 24 hours a day. Try RIU Plaza Guadalajara. It's a 4.50 star rated hotel in Guadalajara that offers concierge services 24 hours a day. Try Ã�urea Hotel & Suites. It's a 3.50 star rated hotel in Guadalajara that offers concierge services 24 hours a day. This hotel has nightly rates as low as $42.00 per night. Try Presidente InterContinental Guadalajara. It's a 4.00 star rated hotel in Guadalajara that offers concierge services 24 hours a day. What about low rates on non-smoking hotels in Guadalajara? 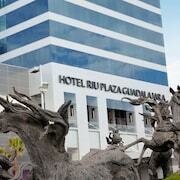 Ramada Encore Guadalajara offers non-smoking rooms for just $80.00 per night. This hotel has a 3.50-star rating. Real Inn Guadalajara Expo This hotel has a 4.00-star rating. Hotel Ejecutivo Express This hotel has a 3.00-star rating. What are the cheapest Guadalajara 3-star hotel deals? Our 3-star hotels bring you quality accommodations at a lower price point for the perfect, budget-friendly vacation in Guadalajara. With 176 3-star hotels throughout Guadalajara to choose from, you still have options. Browse our selection below. 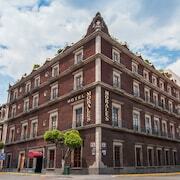 Hotel Morales Historical & Colonial Downtown Core has rates as low as $65.00 per night. This hotel sits in the city's historical district and is 3 blocks from the Metropolitan Cathedral and the Degollado Theater. Hotel Victoria Ejecutivo has rates as low as $73.00 per night. Situated in the business district, this hotel is 1.2 mi (1.9 km) from Plaza del Sol and 2.5 mi (4 km) from La Minerva. Expo Guadalajara and National Chamber of Commerce are also within 2 mi (3 km). Holiday Inn Hotel & Suites Guadalajara-Centro Historico. Located in Downtown Guadalajara, this hotel is within a 5-minute walk of Plaza de Armas and Metropolitan Cathedral. Hospicio Cabanas and University of Guadalajara Assembly Hall are also within 1 mi (2 km). El Tapatio Hotel And Resort. This family-friendly Tlaquepaque hotel is located near the airport, within 3 mi (5 km) of Regional Ceramic Museum, Plaza de Toros El Centenario and San Pedro Parish. Refuge Cultural Center is 3 mi (4.8 km) away. What are the best deals on 4-Star Hotels in Guadalajara? Guadalajara is full of hotels and it can be hard to narrow down where you really want to stay. Luckily, we've done that hard work for you be narrowing you from 307 hotels throughout Guadalajara, to the 24 4-star hotels in Guadalajara. Our 4-star hotels in Guadalajara are exactly what you need for your next family trip, romantic weekend, or solo getaway. Check out our most popular deals below. Hilton Guadalajara: This family-friendly Guadalajara hotel is located near the airport, within a 10-minute walk of Expo Guadalajara and Guadalajara WTC. La Minerva and University of Guadalajara Assembly Hall are also within 3 mi (5 km). RIU Plaza Guadalajara: Located in the heart of Guadalajara, this luxury hotel is within a 15-minute walk of La Estampida Sculpture and La Minerva. University of Guadalajara Assembly Hall is 2.7 mi (4.3 km) away. Presidente InterContinental Guadalajara: Located in the heart of Zapopan, this spa hotel is 0.2 mi (0.3 km) from Plaza del Sol and 2 mi (3.1 km) from La Minerva. 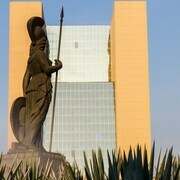 Majestic Casino and Expo Guadalajara are also within 1 mi (2 km). NH Collection Guadalajara Centro HistÃ³rico: Located in Downtown Guadalajara, this hotel is steps from Biblioteca Octavio Paz, Plaza de Armas, and Metropolitan Cathedral. Hospicio Cabanas and University of Guadalajara Assembly Hall are also within 1 mi (2 km). What are the best activities to do in Guadalajara? Guadalajara & Tlaquepaque City Tour: Starting at just $77 per person. Romantic Lake Chapala Tour: Starting at just $77 per person. Tequila Distillery Tour: Starting at just $77 per person. Tequila & Casa Sauza Tour: Starting at just $59 per person. What are the most popular attractions in Guadalajara? People travel to Guadalajara from all around to witness the incredible sights and attractions. With 5 sights to see during your stay, you're sure to have a busy trip in Guadalajara. Below, we've listed some of our favorites. Excellent location , kind staff, beautiful City. You need go. Definitely I will return to this hotel, great location, super clean and staff is very friendly and helpful Highly recommended.